'Avengers Arena: The Complete Collection' Review – AiPT! Terror in their eyes, their wits mostly stripped from them, 16 superpowered teenagers ranging in popularity from X-23, to Nico and Chase of the Runaways, and down to often overlooked entries like Mettle and Reptil, are dropped onto an island and told to kill. Who? Each other, of course. Is it a creative setup? Well, no (the villain admits as much). Does it work anyways? In the capable hands of primary writer Dennis Hopeless and artist Kev Walker, hell yes. Avengers Arena: The Complete Collection is a sometimes uneven but always fun, thrilling, and often unpredictable effort that avoids the pitfalls of most teenage hero-starring comics, highlights their strengths, and doesn’t pull many punches, literal or metaphorical. The plot is complex (but not overwhelming) and keeping up with all the twists and turns Hopeless sets and up executes over the book’s run is half the fun, so we won’t ruin it here. But, suffice to say that the book follows our cast of teens set to kill each other in a total Battle Royale/Hunger Games rip-off plan. A plan, set in motion by perennial murder game favorite, Arcade, who here is rendered as a broken, terrifying and fearless quasi-Final Fantasy villain that I felt myself largely endeared to the treachery of. Hopeless writes a good villain, several of them experiencing various arcs by the book’s end which is a large part of the enjoyment here. In fact, seeing how characters peak and drop off in their relatability, the stresses of this highly volatile situation and the inter-mingled nature of their relationships all heightening the pressure, is thrilling stuff. That it remains thrilling throughout the books’ 18 issues is a real testament to the restraint and hairpin tension Hopeless can maintain. None of them start this game wanting to kill each other necessarily, but when they start to make those decisions, we often understand, and relate to why, even if we and they themselves know it’s a wrong, painful, thing to do. X-23 being a stand out star, as she always is, her arc is particularly compelling — a good indication of the direction her character would take in becoming Wolverine. Struggling with her compulsive, murderous instincts, restraining them and attempting to retain some semblance of friendships at the end of all of this (it helps that all of the other participants know that she isn’t always in control, and that they’re often scared of her enough to just stay out of her way) she sits on a tightrope between friendly Laura and murder machine, an evocative example of the sometimes more inner turmoil the rest of the ever-dwindling cast is going through such as the push and pull between Chase and Nico. Less effective, though, is the reliance on internal narration and monologue segments. I have a feeling that this may have been a more interesting trick in single issues, more split up. But here? The frequency with which issues start and end, or are broken up with them, is palpable and it quickly becomes noticeable that Hopeless isn’t writing these characters as varied as he thinks he is — stuck in a kind of melodramatic echo chamber as we visit all of their backstories (many of which should’ve been condensed or not visited anyways). It’s not an entirely unforgivable offense, and your mileage may vary depending on how much you want things clearly spelled out, but it often feels like the work done with narration could be done better with dialogue instead which also would’ve left room for a slower, more comprehensive build to what happens in the final issue — a kind of rushed, incomplete attempt at flipping the script on the reader that isn’t entirely earned. While the writing does get inconsistent or a tad bit tedious, though, the art is largely consistent, expressive and compelling. Things are appropriately tense, explosive and evocative. Characters are incredibly expressive: a wide gamut of emotions from genuine surprise, to dismay, to fury on display on top of a backdrop of stupendous effects like explosions, laser blasts, tackles, and the like. In a book full of teenagers doing horrible, violent things to each other, Walker’s art makes that intensity palpable and real in a way that feels appropriate but not gross, tense but not audacious. It’s unfortunate then, that there are issues not penciled by Kev Walker, which create a kind of break-neck change in tone that’s hard to adjust to (and also cast a weirdly perverse eye on some of the female characters in some cases), but those are what they are and can be largely overlooked in a fantastic compendium of grit, turmoil and intoxicating action. This is all to say that while Avengers Arena does have faults, and noticeable ones, it succeeds despite them. Hopeless and Walker are a wonderful team, the other contributors here also meeting the fantastic standard they’ve set and the book, as well as the horrible game contained within, is all the better for it. These kids aren’t having fun, but you just might. I certainly did. 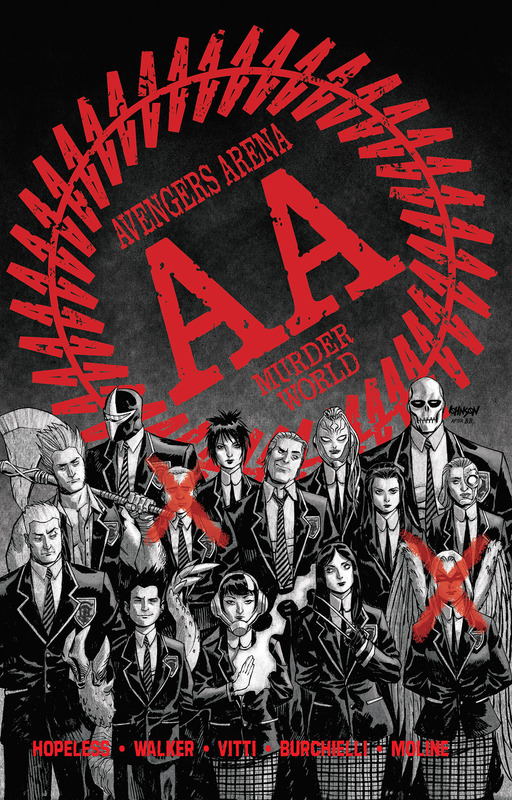 A not entirely original but wholly fun, chaotic, and endlessly unpredictable story makes Avengers Arena: The Complete Collection a great buy for anyone interested in all-out teenage warfare (and is willing to sit through a little tedium to get there). Kev Walker's art is wonderfully consistent and honed: the effects explosive, the faces expressive, the violence kinetic. This take on Arcade as a Final Fantasy-esque trickster God is a lot of fun, the book deserves even more of him than we get. Very few of the twists and turns feel forced or choreographed! Hopeless writes an organic, compelling story that feels natural and tense. The final issue is a real let down, culminating in a series of events that just feels too rushed -- we needed more time to get there. The trick of relying on internal monologues and flashbacks grows boring long before the book moves past them. Issues not penciled by Walker feel out of place and off-tone.